This is the first time this beautiful rose has bloomed in the eight years we have been at our home. My father moved it from under the shaded trees about a year ago, not believing it would ever bloom. 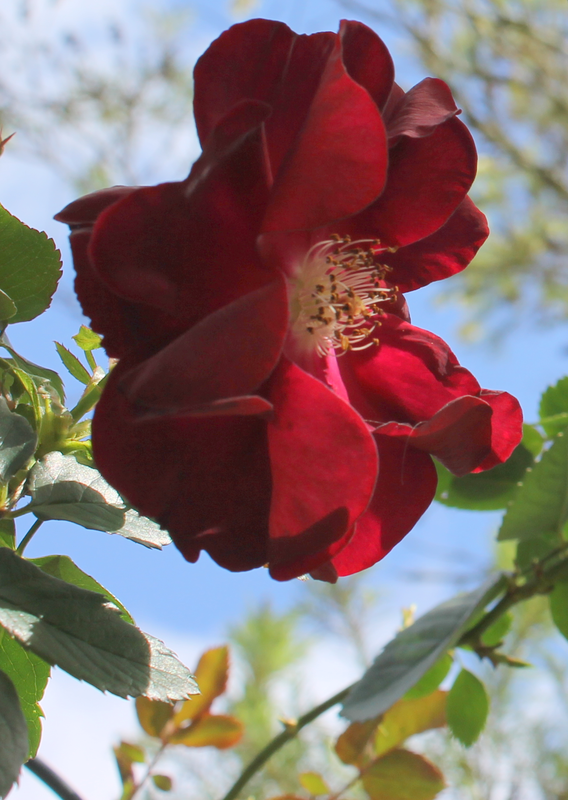 A few times I asked the Lord to reveal the flower, to have the rose blossom that He may be given the glory, as my father who is an avid, really avid gardener (his life passion, one who knows most of the Latin names) didn’t think it was possible. The leaves had always flourished even in the shade; but as to the colour of the flower, we had no idea. It doesn’t matter if, when prayers are lifted heavenward, you see no change in your life or the lives of others. Underneath, within, the Lord is working mightily in our lives and waiting for His perfect timing to reveal the gift of His answer. His encouragement … Never give up, always believe that He can do anything, be patient, trust in Him, He loves us and will give us the desires of our heart according to His will for our life. My heart was to see the beautiful bloom upon this rose, suppressed beauty released and to bring glory to God. To reveal to unbelievers that there is nothing too difficult for our heavenly Father. Another reason why this to me is so personal, is that this is the eighth year of illness that has had my life on hold in so many different areas. I have learnt and am learning so much about my Father’s love for me through http://www.beinhealth.com that in the physical the layers of affliction (non existent petals) are just peeling off and being discarded; but in the spiritual and soon to flow into the physical, beautiful healing is taking place and a new blossom of His life is forming in me, just waiting for His perfect timing to be revealed. How perfect that the rose that was given me was the colour of His sacrifice. His death and resurrection for me. He has given me new life, new hope. Eternal life. Thank you my Father for the depth of Your love for me, for us and believing in Your Son, knowing that He would fulfill every intricate detail of Your merciful gift for all. Thank you Jesus for Your obedience in going to the Cross because of Your love for Your Father, for me, for us. The depth of Your pain that You suffered for me, for us. Praise God You are risen. Seated on high. Thank you Holy Spirit for Your comfort, conviction and ever present peace even amidst turmoil. For bringing the Father’s love to me, to us. Embracing with love eternal.